When you select an area of the Shroud to examine in the above Master Photograph, point and click directly on that specific part of the image. You will be shown two, side by side closeups of the area you have chosen. One as it normally appears to the eye, and the other of the same area as it appears on a photographic negative. Remember, images on a negative are normally flipped left to right. With the exception of the facial image of the Shroud, the negative images included here have not been flipped left to right. This allows for easier visual comparison. The negative images have been enhanced digitally to increase contrast. Below each set of closeups is a small Reference Icon highlighting the area you are currently viewing. Click on the Reference Icon to return to the Master Photograph and choose another area to examine. The image on the Shroud of Turin is very subtle. The closer you get, the less distinct it becomes. 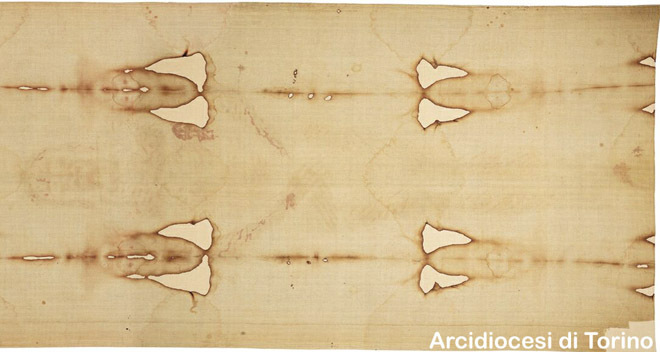 One of the best ways to look at the Shroud image is on a photographic negative. There, the light and dark values are reversed and the image appears more realistic and natural. The above views of the dorsal image on the Shroud are provided for reference only and do not allow you to examine close ups of the image like the Master Photograph at the top of this page does. You will notice that there is a difference in color and sharpness between the Ventral and Dorsal images. That is in part due to improvements in scanning and image processing since this page was first created in January 1996. The Dorsal images are from Photo-CD scans of my original 4" x 5" film and the color is more accurate to the actual color of the Shroud. They also are considerably higher in resolution. After viewing the images in this area of the website, you might wish to obtain Shroud photographs for your own personal research and study. Currently available are 8.5" x 11" lithographic print sets, miniature Shroud replicas on cotton canvas, lithographic posters and much more. For detailed descriptions and ordering information, visit the Website Store page of this website.